We planted our peas in February and counted every milestone we could invent: First sprout poking through the ground. The number of peas shoots that made it past the onslaught of slugs and snails in the first two weeks. The first tendrils to curl themselves around our fence. The first lightly scented white blossom. And finally our first full pea-pod. I never dreamed that each of the “Tall Telephone Garden Pea” seeds we ordered in the winter would live up to their name. I have been tying down fallen the top two or three feet of each plant because they have overgrown the fence. If I staked them properly they would grow ten feet tall (which is great in my son’s opinion because he is waiting for the “pea stalks” to grow tall enough to climb into the clouds). I would guess that each seed ended up producing about thirty pea pods. Luckily my children are pea maniacs so we never are short on ideas of how to use them up. 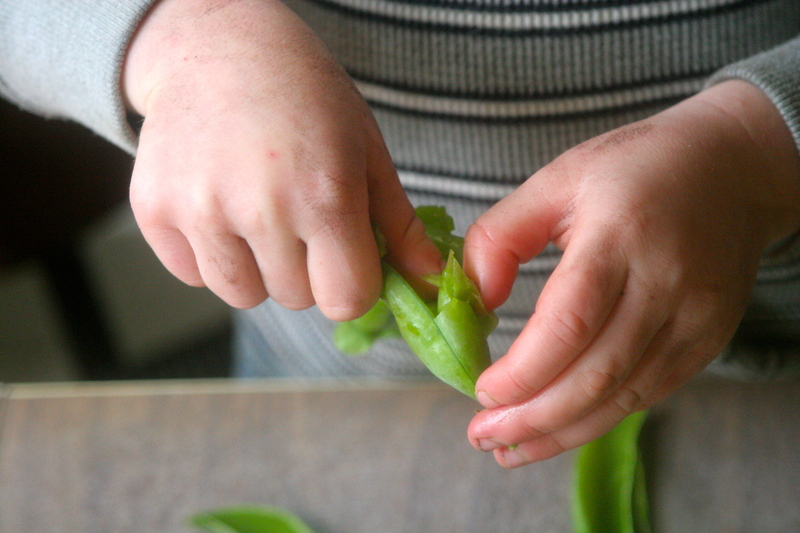 My little helper, shelling peas for our dinner. I should add that most afternoons since we made this garden in late January, my son and I spend at least an hour out there together for some mother-son time while my daughter finishes her nap. It has been one of the most wonderful parts of being a parent. Yes we dig, we weed, we plant, and we harvest. We also tell stories (that always include members of his imaginary and growing gang of 100 something friends saving the day). We drink special concoctions of honey-milk-tea or lemonade depending upon the weather. Finally, we enjoy the beauty of the garden that day and assess how each plot is growing, imagining what it will look like when my son….ahem, garden, grows up. I decided to make a slightly warm dinner salad with barely cooked blanched peas and new potatoes (Rose Apple Finn, a fingerling variety). 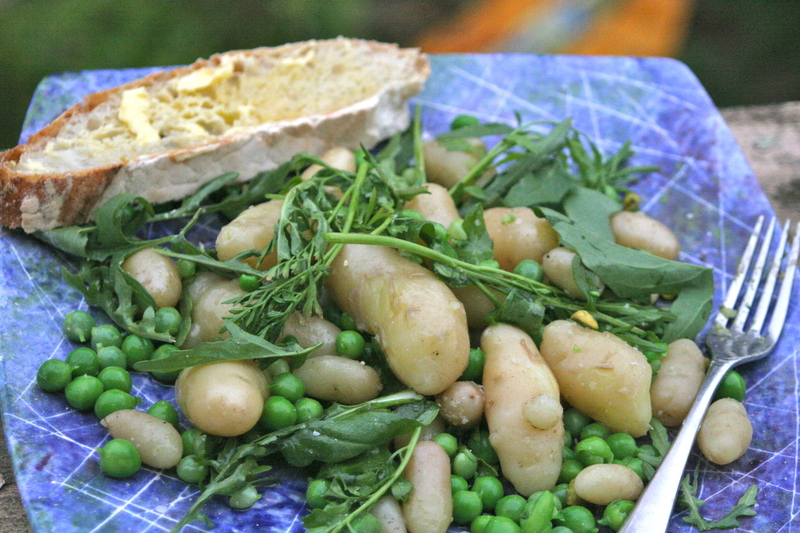 I have rhapsodized on new potatoes before, but I enjoyed them even more last night, mostly because we had more of them, two even the size of the larger peas! The reality is that those two vegetables stand alone with just a dusting of salt and either butter or wonderful extra virgin olive oil. I couldn’t resist fancying it up a bit more, however with some wild arugula, regular arugula, and peppercress all from our garden as well. Add a handful of toasted pistachios and you are ready to go. When you make this you have two ways to serve it. 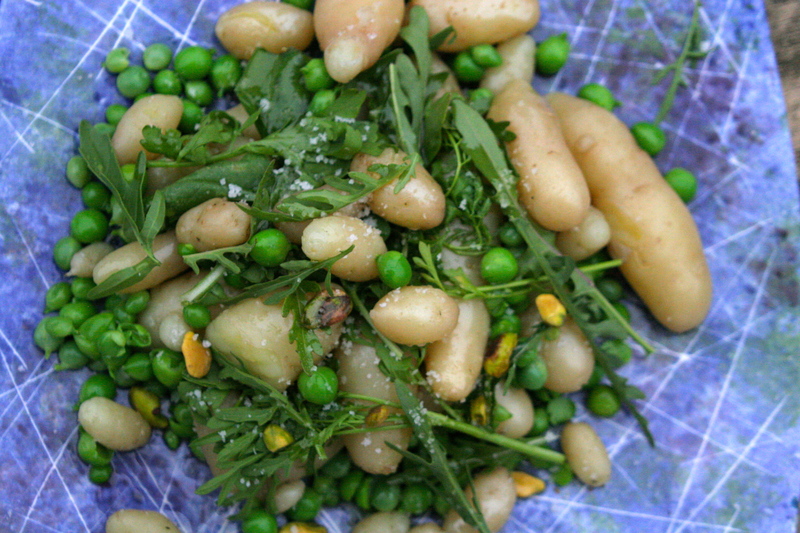 You can serve it cold/room temperature, by tossing the cooked peas and potatoes into ice water to cool them down or you can serve it warm, without rinsing them at all after cooking. If you go with the warmer option, add the lettuces immediately before serving because they will wilt (especially if they are fragile new garden lettuces). Eat with fresh, homemade ciabatta with fantastic butter. Bring a pot of salted water to boil. Add the new potatoes, skin on. Depending upon the size of your potatoes they may take anywhere from 5 minutes to 10 minutes to cook. Pierce them with a fork and bite into one (cooled!) to see if they are done. Add the peas to the potatoes for the last minute of cooking and then drain all together. If you are serving the salad cool or room temperature, plunge them into a bowl of ice water for a couple of minutes. If not, just set aside to drain in a colander and proceed. Place the potatoes and peas into a serving bowl and add a couple of glugs of extra virgin olive oil, about 3 tablespoons, and the lemon juice, if using. Toss them all together and then add in the salad leaves of choice, pistachios, and salt, tossing lightly to coat. Serve immediately. 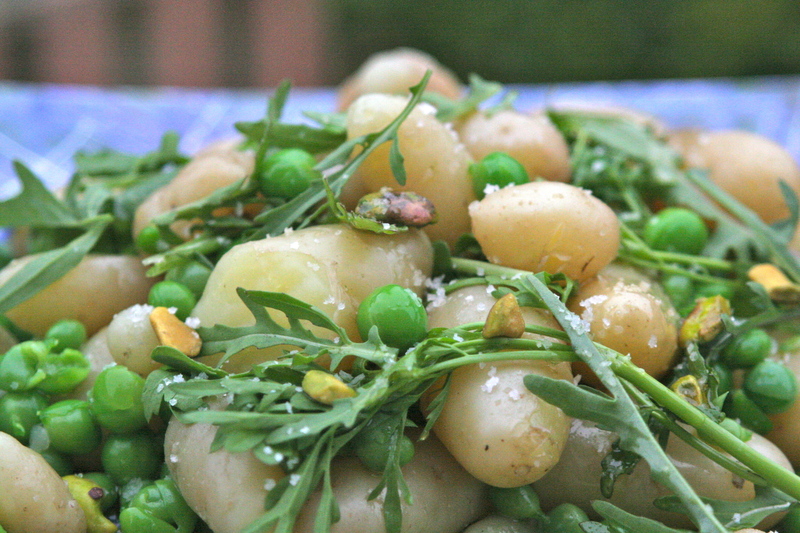 This entry was posted in Dinner, Peas, Salad, Uncategorized, Vegan and tagged new potatoes peas recipe, potato pea peppercress pistachio recipe, salad with peas lettuce and potatoes, what to cook with new potatoes. Bookmark the permalink. What an inspiring post, AM. The boy will remember his special mommy-and-me gardening time for the rest of his life, and more. Well-done, mama. That salad looks absolutely delicious. Thanks Ellie. It’s pretty hard not to draw the comparisons between one’s family and a garden, especially when they are so tied together.